Rescue Crews Race To Find Survivors In Rubble Of Quake-Hit Italian Towns : The Two-Way Officials put the death toll at more than 260. 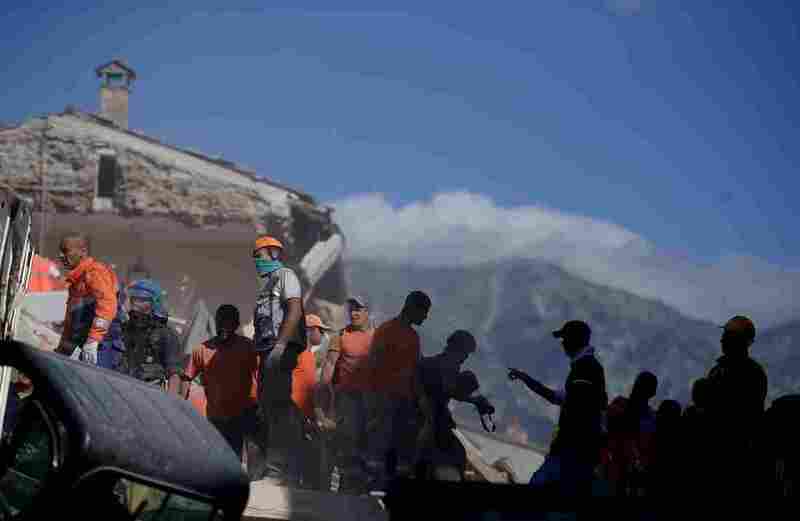 There is a fairly narrow window of time after a quake when survivors can be saved from collapsed buildings, and search crews are fighting the clock. 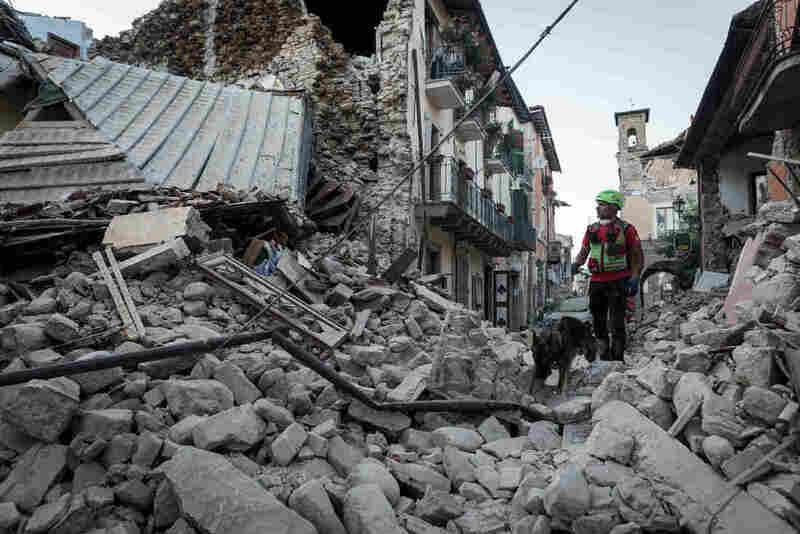 A 6.2 magnitude earthquake devastated central Italy, destroying numerous villages, including Accumoli. Rescue teams are searching for survivors and victims. Officials in Italy say the death toll from Wednesday's powerful earthquake has risen again. The Associated Press reports that the country's civil protection agency now says 267 people were killed. The number of injured being treated at hospitals stands at 387. Aftershocks continue to rumble through central Italy. On Friday, an aftershock registered with a preliminary magnitude of 4.7. More than a day after a powerful earthquake struck central Italy, rescue teams are desperately searching for survivors in the rubble of once-charming mountain towns. Volunteers move rubble and debris during search operations in the town of Amatrice on Wednesday after a powerful earthquake rocked central Italy. At least 241 people died in the disaster, according to civil protection officials, The Associated Press reports. Many of the devastated communities are difficult to reach, and the exact number of missing persons isn't known. The number of possible casualties is unclear partly because, as we reported Wednesday, the affected communities in the Apennine Mountains are popular vacation destinations, particularly in the summer. It's more difficult to determine how many tourists were passing through than to count up the permanent residents. Christopher Livesay, reporting for NPR from the town of Amatrice, says aftershocks have made it more difficult for first responders to continue their life-saving work. "But there's still hope in the air," he said early Thursday morning. "These are people who have been working around the clock nonstop despite their fatigue. They're still moving forward — they have about 100 hours in which they can still expect to find people surviving underneath the rubble, and since the earthquake was only about 30 hours ago, there's still time." But hour by hour, the odds worsen and rescuers become more likely to find a corpse than a survivor. 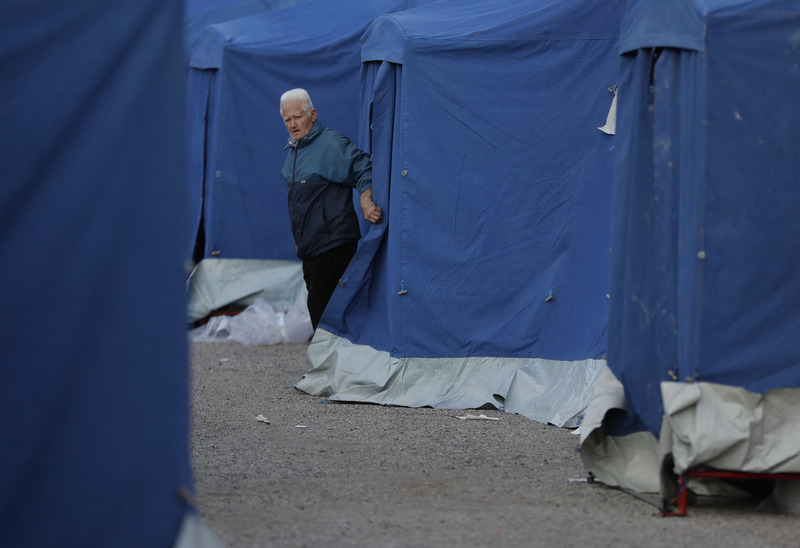 A man walks out of a tent in a camp near Pescara del Tronto, Italy, on Thursday. Italy's civil protection agency set up tent cities around the towns affected by Wednesday's powerful earthquake to accommodate the homeless. It's hard on morale, Livesay says. "That said, today is a new day," he says. "There are fresh rescue workers here, and people I've spoken to from rescue-dog handlers to police officers to ambulance drivers, they're still optimistic." As he spoke, dogs were barking in the background. The sniffer dogs play a central role in first responder operations, identifying people — dead or alive — trapped beneath rubble, he says. Meanwhile, thousands of survivors are homeless. Many houses that weren't destroyed are too dangerous to sleep in, with large cracks in the buildings putting them at risk of collapsing in an aftershock. Some people are sleeping in tents, away from structures, Livesay says, while others in Amatrice have taken refuge in an auditorium. NPR's Eleanor Beardsley has been driving through the area, passing through a number of villages destroyed in the earthquake. "The roads are tiny little mountain roads and they're blocked with emergency crews, military trucks, detours, rubble, so it's hard to get anywhere," she says. "But you don't have to go far to see the destruction." The earthquake is the most powerful and most deadly since the 2009 earthquake that hit nearby L'Aquila. "Since then there has been a lot of talk about reinforcing old structures that survived and restoring badly damaged buildings in a way that would protect them from future earthquakes. But Alessandro Martelli, president of the Italian Association on Anti-seismic Systems, says there hasn't been much progress.
" 'We are talking and talking and talking but not in a very useful way,' [he says]. "Martelli says one big problem is cost. Most communities simply aren't willing to invest in their historic structures to protect them from future earthquakes. ... Of course once a building has been damaged or destroyed, the cost is a lot higher." And as communities argue over what to do with their historic structures, the result is that not much happens, Jon says.